The following is compiled from previous efforts by Steve Shanks and others, with input from Christian Maloof. I've tried to consolidate the information into one page. If you have additional questions, please contact us and we will try to answer it as best as we can. Additional general information about a driver education event can be found here. What is Driver Education (DE)? Do I have to be a Porsche club member to participate? How much does it cost? Where can I get a tech inspection for my car? How long is the tech inspection for my car valid? Can I drive a vehicle other than a Porsche? Can I drive a convertible? Or a race-prepped car with race harnesses? Or an open-wheel car? What should I wear for a DE event? Can I take pictures or record video on or at the track? Is gasoline available at the track? What is a typical track day like? Driver education is a program designed to help you understand driving dynamics using your own car in a safe and controlled environment. It is not a racing school, although it is held on road courses from around the area, such as Waterford Hills and Grattan. Participants are divided into groups based on experience and skill levels, from Beginners to Advanced Drivers. Class and driving instructions are provided by Rally Sport instructors. This is sometimes also called high-performance driver education (HPDE), probably to distinguish it from driver education courses conducted in yellow-labeled cars trying to park between cones in a school parking lot. No, you don't have to be a Porsche club (PCA) member to participate, but if you are a PCA member, you will get a discount off the registration price. For the cost, please see the main Driver Ed page, as the prices may be adjusted occasionally. There are two ways to register. The preferred method is to register on-line through www.motorsportreg.com. You will have to create an account on the site to register for various events there. The second way is to go to the forms page and download the registration form. Fill it out and mail it along with your payment to Burghard Linn, 5248 Milroy Lane, Brighton, MI 48116. Events are held rain or shine (I don't know about snow, however). Please bring appropriate gear for the expected conditions during the DE event. Many of our local advertisers that work on cars will also do tech inspections. Check the latest Bahn Stormer for the current list. Some of the local Porsche dealers will also do a tech inspection. Call any of these sources for costs and availability. There is also a list of qualified inspectors in the tech inspection form that can do a tech inspection on your vehicle. Additionally, inspections may be done during some tech events. A schedule can be found here. Tech inspections are valid for 30 days or one track event, which ever comes first. A tech inspection for your car is valid for 30 days, or until the next driver education event, which ever comes first. If you are interested in track-only insurance, you can try Lockton HPDE Insurance, designed specifically for these events. You don't have to drive a Porsche, but the vehicle must be inspected before going on the track. Also, some tracks have their own regulations. For example, Waterford Hills has a sound limit of 75 dB for vehicles on the track. 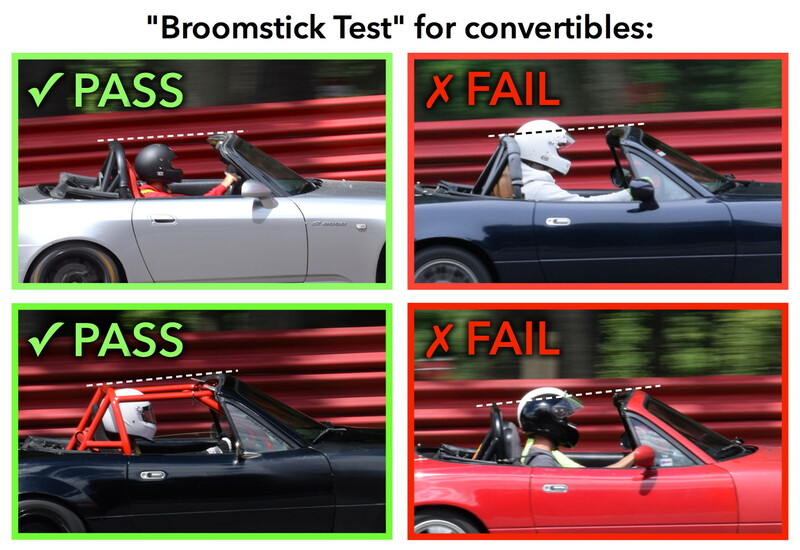 Convertibles without rollbars are not permitted. Convertibles are allowed in the beginning group (green group) if it is installed with a factory roll over protection that meets FMVSS (Federal Motor Vehicle Safety Standard) 216. For these cars, the soft top must be in the up position or the hard top installed. For a race-prepped vehicle, it must still pass the Rally Sport tech inspection. Also, for all vehicles, the safety restraints and seats for the driver and passenger must be the same. (Please check the PCA Driver Education website for more information on safety harnesses.) Check with the appropriate track for any additional requirements. Open-wheeled cars, such as the Ariel Atom, will not be allowed for track events. Please contact someone on the track committee if you have a question about your car’s eligibility. While driving your vehicle on the track surface, you must wear a long sleeve cotton shirt, long cotton-based pants, cotton socks, and leather or cotton canvas shoes. Footwear must be enclosed, non-slip, with a relatively smooth sole. Tennis shoes are acceptable as are professional driving shoes. No high-heels, sandals, nor hiking-type, deep-lugged soles. If a participant wears a driving suit, it must be one that is approved for PCA club racing. You should also bring appropriate clothing for weather conditions, such as for rain, hot weather, etc. Yes, for your own use. But the Rally Sport Region strongly discourages filming of any incident at a PCA Driver Education event; and certainly request that any available film not be posted on the Internet. PCA is a club founded on fellowship and enjoyment of our cars. One's misfortune on a bad day at the track should not go public. We ask that you remind your fellow participants to remember the "Golden Rule" when they might be considering how to handle the filming or posting of a driving incident. No gasoline is available at Waterford Hills. Be sure to have enough before the event. But if for some reason you do run low, there are gas stations within a few minutes of the track. I unfortunately do not know who originally posted this page, but this DE Introduction page gives an account of a day on the track. If you know who created this page, please let me know at the link below so I can credit this accordingly. This will be combined later with the general description of driving events, as some of the material is repeated. Finally, this is a timeline of what you should do for a DE event. Please contact our track chairman or track registrar for more information. Links to their contact information is on the right column.